Plant breeders may have given us some beautiful gems but they are also responsible for pushing some truly monstrous creations into our gardens. The problem is that they don’t know when to stop. Creating new plants is so addictive that breeders continue way past the point at which the qualities of the original plant have been lost. This is particularly true of Fuchsias. The species plants are elegant, charming, and comfortable garden plants; modern hybrids are blousy and brash, and end up quarrelling with everything else in the garden. Coco Channel said that simplicity is the keystone of elegance. The simplicity of species fuchsias has been replaced by the ostentation of the hybrids, and the elegance of the plant has been forfeited. Coco has morphed into Edna Everidge. The extravagantly ornate flowers of most fuchsia hybrids, and the difficulty of placing them with other plants, often means that the whole genus is overlooked. The gardening-style mavens have kept all of them out of the garden. As with Gladiolus, Chrysanthemum, Dahlia (until recently) and other similarly-maligned genera, the Fuchsia family has some wonderful plants within it. The first European to document fuchsias was a Jesuit priest. At the end of the seventeenth century Father Charles Plummier was travelling the French Antilles not to save souls but to collect plants for his employer, Louis XIV. He came across fuchsias growing on Hispaniola (the island that is now Haiti and the Dominican Republic) and published a description of the genus in 1703. To show his esteem for an earlier German botanist, Leonhard Fuchs, Plummier called his plant Fuchsia tryphilla flore coccinea . Under the Linnean system this became simply Fuchsia triphylla. Linneaus may have made plant names far clearer but he often robbed them of their poetry. Plummier documented many other southern-American plants, including frangipanni which Linneaus named Plummeria in his honour. Jesuit priest though he was, he clearly had an eye for the flamboyant. While it was a Frenchman who described the plant, it was a British sailor, Captain Firth, who brought the first living specimen to Europe. The plant (probably F. magellenica or F. coccinea) arrived at Kew Gardens in 1788, and a decade later was being sold by an astute nurseryman for an eye-watering £20 per plant. New species continued to arrive throughout the nineteenth century and the plant breeders got to work producing hundreds of new hybrids every year until just before the First World War. Hybridisation re-started in earnest in the 1950s and continues today with breeders vying to produce plants with larger blooms, with ‘true blue’ flowers, or to develop the first yellow-flowered fuchsia. The most widely known of the species fuchias is F. magellanica. This is the shrub whose pendant red flowers brighten the hedgerows of Cork and Kerry throughout the summer. Originally from Chile and Argentina, the plant has adapted so well to those parts of Ireland cosseted by the Gulf Stream that it has muscled out many native hedgerow plants. It has even become the symbol of West Cork’s tourist industry. F. magellanica is supposed to only withstand temperatures down to minus ten degrees Celsius but on well-drained soils will survive even colder winters. The form F. magellanica var. gracillis is more vigorous than F. magellanica itself and has slender, arching stems with dark red flowers that have a deep purple interior. My own favourite form is F. magellanica var. molinae whose flowers have a white tube and sepals and a very pale lilac corolla. 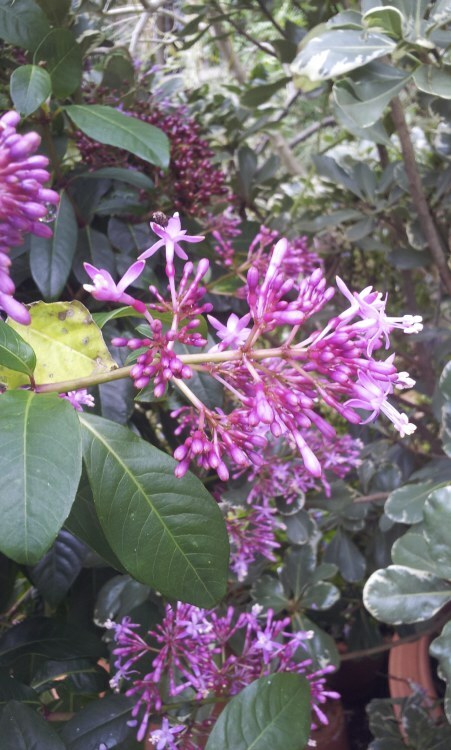 It grows well in shade, where the flowers have just a hint of lilac. On good, rich soil it will grow to about 1.2m tall. This form is one of the parents of a beautiful hardy hybrid, F. ‘Hawkshead’, which has small white flowers that sparkle against its dark foliage and will grow in sun or shade. Again, it usually grows to about 1.2m tall but I have seen a magnificent specimen in a sheltered London garden that is over 2m tall. Most of the the other species fuchsia are not hardy and either have to be protected from frost during the winter or treated as annuals. Many are fast-growing and, even in a single season, will become imposing plants. In the wild, F. boliviana is evergreen, grows up to 5m tall and has clusters of flowers that are 20cm long. In cultivation, with the protection of a frost-free greenhouse, it is deciduous and will get to about 1m tall, with slender tubular flowers about 6cm or 7cm long. The species has scarlet flowers, and the white form, F. boliviana var. alba, has white sepals and lipstick-pink petals. If you are growing F. boliviana for the first time, don’t panic if there are no signs of flowers during the summer. It often doesn’t start flowering until early September. F. denticulata is much longer-flowering and more floriferous. The sepals are pink with a green tip and the petals are orange. It flowers most in early summer and again in the autumn. Species Fuchsia have been grouped by botanists into nine sections and in the same section as F. boliviana and F. denticulata is the most popular of the species, F.triphylla. The contrast between its dark foliage and its dense racemes of orange-red flowers make it a striking plant. There are several gorgeous cultivars but all are difficult to bring through the winter without needing to be mollycoddled in a heated greenhouse, so take cuttings or treat it as an annual. F. procumbens is one of the few fuchsias native to New Zealand. In recent years it has become widely available from nurseries, and this year I saw it for the first time in garden centres. As its name suggests, it is a low-growing plant that will trail over the edge of containers. Its attraction lies in the small upward-facing yellow flowers. The petals are green and fold back along the tube of the flower to reveal startling blue pollen. If you are new to growing fuchsias, an easy one to start with is F arborescens or the closely-related F. paniculata.